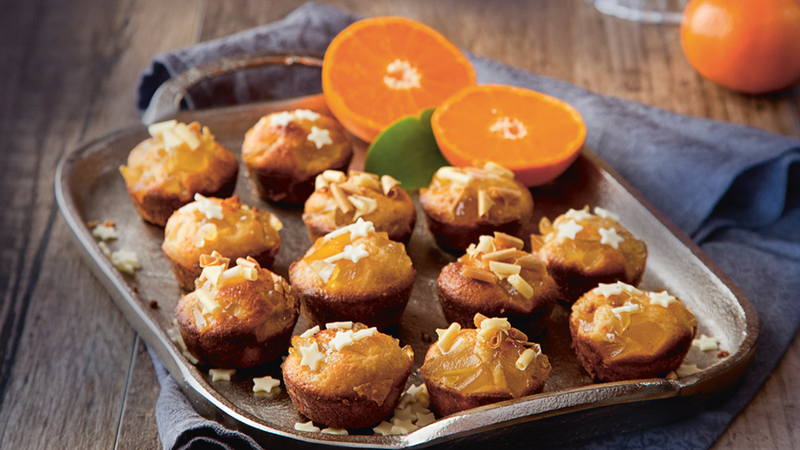 Clare's Clementine and Ginger Financiers are perfect for any party. 1. Melt the butter in a small pan and continue to heat until the solids just start to brown. 2. Sift the icing sugar, flour, baking powder and salt into a large bowl, then stir in the ground almonds. Add the egg whites and whisk for 1 minute, then add the clementine zest. Pour in the browned butter through a fine mesh sieve and whisk for a further minute. Chill the batter in the fridge for 1 hour. 3. Preheat the oven to 165°C/gas mark 3. Grease a mini muffin tray and set it on a baking tray. 10 to 12 minutes, until golden brown. wire rack to finish cooling. Once cool, brush with a little of the syrup from the preserved ginger and add a few sprinkles. so they looked like small gold bars, which gave this treat its name.